Police harass Pilato and Laura Miti – picture courtesy of News Diggers! 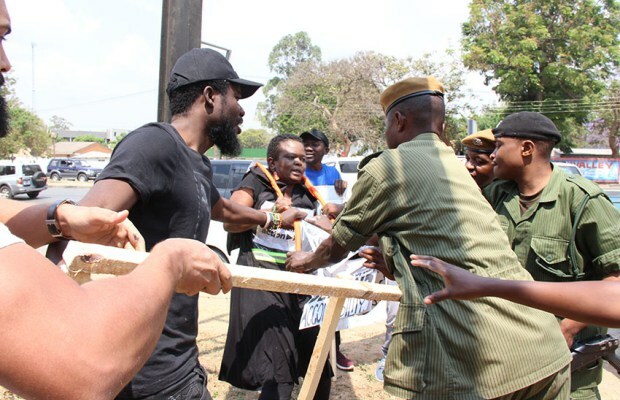 Police in Lusaka have arrested musician Pilato, Alliance for Community Action (ACA) executive director Laura Miti and Patriots for Economic Progress (PeP) president Sean Tembo and other protesters who had gathered to demonstrate against the controversial procurement of 42 fire engines. Police had earlier summoned Miti to the Service Headquarters following her insistence to go ahead with the demonstration. Yesterday, police warned of “serious action” if the ACA and others defy advice not to stage a peaceful protest outside Parliament during the presentation of the national budget. But the protesters gathered at Puma Filling Station at Arcades around 12:30 led by Pilato, Tembo, and ZCSD executive director Lewis Mwape around 12: 30 hours and were joined by Miti at 13:00 hours after returning from her meeting with police. Carrying placards demanding action on those involved in the purchase of 42 fire tenders at $42 million, they peacefully marched to Parliament. As they approached the gate, some police officers grabbed and destroyed their placards. The police however did not arrest the PF cadres that had gone to stage a “solidarity march” for President Edgar Lungu’s government. Lets make correct and responsible actions, why is everyone seeking attention nowadaya? If pipo hv evidence why nt simply report to the law enforcement agencies? Taking the law into your own hands wont benefit you. May be dats hw our collegues earn their living? Jst produce evidence of your claims and action wl taken against the alleged culprits whats your problem dont you hv busy schedules both at work and home? That’s the problem with people like you so called truthpains. You prefer the docile route just to keep the peace. Wake up and smell the coffee. Which law enforcement agencies in Zambia are you talking about? Everybody knows the police/army/ACA are under lungu and his minion’s spell. You obviously belong to lungu’s “club”. Allow people to protest. They’re not causing any harm to anybody. The people responsible for blocking the protests are obviously guilty and afraid of the truth coming out. Why else would they block the protest if there’s nothing to hide? For this one, the police should have just allowed them to demonstrate and express their opinion. The problem is that with this arrest, as usual people will blame the President! Mwebantu have mercy on the president as he cannot do everything! Too bad that some fellow Zambians will sleep in cells. Corruption is the way others perceive things and these Zambians should be allowed to see things that way. It hurts me that newly independent RSA already has a mature police than Zambia and yet, we were the first to get independence. RSA police allow demonstrations anytime anywhere and for anyone to do so and the police are always there to ensure protection of public safety and property. Let us move forward ZP otherwise our democracy will take very long to mature and you will continue to bring our Republican President’s name into unnecessary ridicule. Police are acting as agents of terror and tyranny!